The Sailing Innovation Centre helps to accelerate innovations in sailing. In this way the centre supports the sporting ambitions of the Netherlands in sailing, promotes interest in sailing and contributes to economic growth by supporting companies in realizing new and better products and services. In short: more medals, more people to experience the sailing sport, and more business. What does the Sailing Innovation Centre do? Sailing Innovation Centre initiates and stimulates intensive cooperation between sports, science, business and government. The centre functions as the counter where sailing teams, clubs, sailing competition organizations, companies, municipalities and other public, private or civil society organizations can ask questions about innovations in sailing. At previous Olympic Games in London and Rio de Janeiro, the Sailing Innovation Centre carried out location analyses for the Dutch top sailors and measurements in the field of wind and current. The Sailing Innovation Centre has a longer-running research program with the knowledge partners VU Amsterdam and TU Delft. Under the name Sailing Regatta of the Future, the Sailing Innovation Centre is working on a program to make sailing competitions more interesting and more accessible for a wider audience. The Sailing Innovation Centre brings together the right partners to find solutions for innovation questions or to work out and shape new ideas. A hub for connecting. The Sailing Innovation Centre offers an infrastructure for measuring, analysing and insightful presentation of the sailing boat data (position, slope, speed, course), video images of the sailors and data about the environmental factors (waves, wind, current). The Sailing Innovation Centre offers companies such as boat builders and their suppliers the opportunity to test their innovations at sea, in practice. 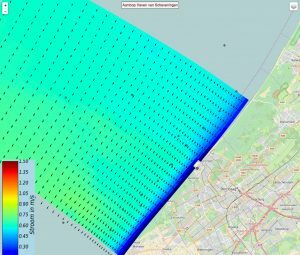 In collaboration with Rijkswaterstaat, the Sailing Innovation Centre offers an interactive map of the seawater flow around the port of Scheveningen. Both direction and speed of the current can be read, plus the expectation for the coming period. A slider at the bottom of the card can be pushed through time. The times of high tide are also indicated. Open map in new window.